The Aurora Australis and the Milky Way are each incredible to observe and shoot on their own. But when they are both in the same frame, it’s an awe-inspiring sight. They can be seen together in the night sky in the South Pole, and Martin Heck recently released this incredible timelapse showing this inspiring sight. Photographer Jesse Watson has been following the SpaceX launches for quite some time. Fascinated by the footage he has seen, he wanted to make a video of his own, different from what he’s seen in the news. So, before the final SpaceX launch this year, he took his gear and created a timelapse that could easily fit in a science-fiction movie. 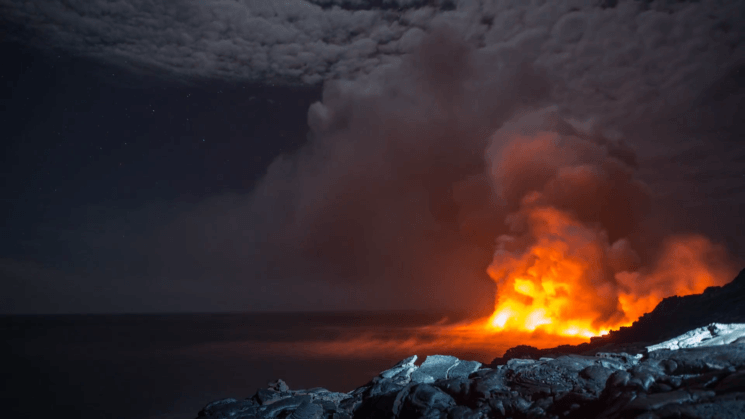 Lava flowing into the ocean is a magnificent sight. In December 2016, it was the first time in over 3 years that the lava flow was entering the ocean in Hawaii. Photographer Jack Fusco didn’t want to miss this opportunity. So, he checked weather reports, moon phases, and National Park Service website. He packed his gear and flew to Hawaii. His idea was capturing starry sky above the lava entering the ocean. He only had 3 nights to do it, and the weather was terrible when he arrived. Despite bad luck with the weather and very limited time, he managed to create “61G Ocean Entry” – a truly awe-inspiring time-lapse. If you enjoy watching time-lapse videos, then you’ve heard of Morten Rustad. After his video “NORWAY – A Time-Lapse Adventure”, he now has a new gorgeous time-lapse video out. “SEASONS of NORWAY – A Time-Lapse Adventure” is recorded in 8K, and it covers 20,000 kilometers of a beautiful country of Norway. It was shot within a course of one year, showing the divine beauty of Norway throughout four seasons. Variable neutral density filters are typically more common for video than photography, but there’s that grey timelapse area in the middle where the two worlds tend to often collide. I usually go with regular NDs for long exposures and timelapse, but having recently picked up a variable ND for video, I have found myself using it a lot more for regular photography, too. Mine doesn’t go quite as dark as Syrp’s new “Super Dark” variable ND filter, though. Offering 5-10 stops of neutral density, the filter will ship in both 62mm and 82mm sizes, with step-up rings to fit other lens sizes included. It also contains built in physical stops and handy markings around the edge of the filter to let you know just how many stops of light you’re blocking. A couple weeks ago I was sitting on the top of a cliff in the dark setting up an eMotimo Spectrum St4 to test out the new gigapixel feature – and I ended up with an unexpected surprise. Due to user error, I photographed a sequence of photos where the Spectrum’s movement was out of sync with the camera shutter – resulting in the Spectrum moving to the next image in the sequence while the shutter was open. Commemorating one month since British astronaut Tim Peake launched into space, the European Space Agency uploaded a cool time lapse showing the preparation and liftoff of the massive rocket. Launched along with Peake were NASA astronaut Tim Kopra and cosmonaut Yuri Malenchenko. The latest Star Wars movie and Quentin Tarantino’s The Hateful Eight played a major role in the recent comeback of 70mm film and its gorgeous qualities. Photographer Andrew Walker was a projectionist on the 70mm roadshow for the latter and created this time lapse of the celluloid film being projected, showing the behind-the-scenes experience is just as fascinating as the final product. For the past two years, Omaha-based photographer Jesse Attanasio has been driving across the United States to capture some of the most beautiful storms and scenery America has to offer.